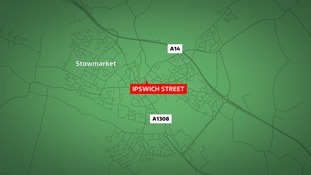 Teenager charged over Stowmarket armed robbery Credit: ITV News Anglia. A teenager has been charged following an armed robbery in Stowmarket in Suffolk. Police were called to a shop on Ipswich Street on Sunday morning after a man - wielding what was thought to be a small axe - demanded cash from staff. An 18-year-old man has been charged with robbery and a drugs offence. A second teenager who was also arrested has been released on bail.